and healthy unprocessed ingredients. We are nestled in the middle of Historic Silver City. We have been serving Grant County for over 20 years. Diane and her children were born in the Bay Area and relocated to New Mexico in the early 1970’s. After winning a number of culinary award, like best in state for New Mexico, she went on to apprentice with a Czechoslovakian master in San Diego. She worked in some of the largest and most prestigious resorts and hotels in Hawaii and Santa Fe. In 1996, she created Diane’s Restaurant, and in 1997, she contacted her son Bodhi and asked him to join the business He had been cooking in a number of well known restaurants in Northern California and Hawaii. Her clientele has steadily grown and the restaurant has made several expansions. Diane’s has become a “town favorite.” It has been a family effort ever since. My culinary career has been in the process for about 30 years. I started with an Associate Degree in the Culinary Arts. After winning an award for Best Apprentice in the State (New Mexico) from the American Culinary Federation, I completed an apprenticeship with Master Pastry Chef, Milos Safark. After that, I worked for The Ritz – Carlton and Stouffer’s Wailea Beach Resort in Hawaii and then for the largest luxury hotel in Santa Fe, The El Dorado. I had family ties to Silver City and returned here and opened a small bakery in1996. Baking is my true love, But! Diversifying and offering more options to the community has been rewarding. I think with my adventurous spirit, I have always been searching for new combinations of fresh products for experimentation. I am constantly developing my styles of Pacific Rim Fusion cuisine. Fresh garlic, fennel, tomatoes, capers, and artichoke hearts are several of the European projects I enjoy fusing with Asian styles of culinary excellence. To share a little more about my past, as a third generation chef, I grew up between my father’s restaurant, “The Trident” and my grandfather’s restaurant. I have been cooking as long as I can remember; perhaps, inspired by the fact that in my family, the one who cooked didn’t do the dishes. I, therefore, started cooking at a young age. I remember many fond memories such as standing on the oven door and flipping pancakes and crepes and how our kitchen was a really a kitchen-based laboratory. As a teenager, I worked my way through high school doing dishes and learning the basics. I was honored to be able to go on to work for some of the most prestigious restaurants in northern California and Hawaii where I developed my culinary traditions. Being an outdoor enthusiast, growing up between the mountains of New Mexico and the beaches of Hawaii, I enjoy working with fresh seafood, produce, and wild game. When my mom needed my help in 1997, I came home to Silver City. Drinks, American fare and great company. No fryer in use. Fresh bread, Boar's Head meat and sweet treats. "This is a wonderful find in such a small town. 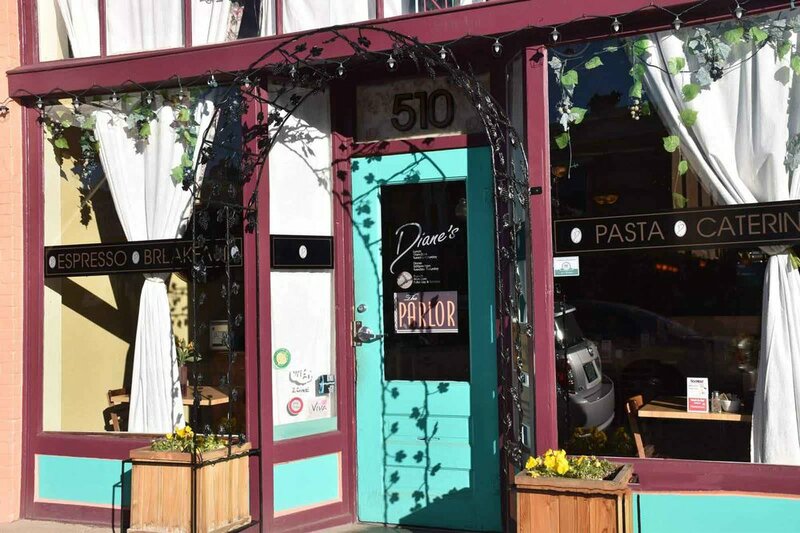 Diane Barrett, who was once a pastry chef at La Traviata and Eldorado in Santa Fe, has brought refined city food to this small town. "